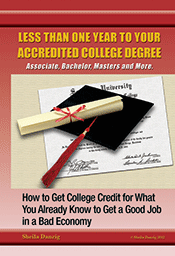 How to Earn College Credit for Learning on the Job! Let’s face it: investing time and money in college isn’t always the right answer. The cost of education rises every year, and more and more students are looking for other options. Many defer the decision to go to school in favor of spending time working and saving money. However, workers with bachelor’s degrees have many more opportunities when it comes to higher paying jobs, and tend to make significantly higher salaries than their peers without degrees. However, it’s also the case that colleges and universities in and of themselves don’t do the best job of preparing students to launch right from graduation into the workplace. Applying the skills and knowledge learned in college to the work environment is a learning curve that can’t be learned in a classroom. In the same way, much learning occurs in the classroom of the workplace. If you’ve taken on more responsibility through your work experience and gained skills and insight that is directly reflected in the changing nature of your work, you’ve learned on the job. College professors often have the authority to grant college credit for work experience of this nature, and you don’t have to be enrolled in school for them to do this. To learn more, visit TheCareerPeople.com and get college credit for the education you got at work.